It’s Fast Pass Time! PLUS: Access to Tips & Tricks! Yes, you heard right…. it’s that time of year again! T-minus a less than a week until the day you’ve all been waiting for…. the Spring ’19 Career Fair! In preparation for this important event, be sure to stop by LaCava 205 today, Monday or Tuesday to grab your Career Fair Fast Pass. 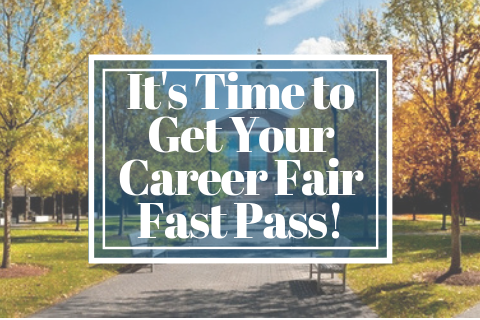 The Career Fair Fast Pass is the only way to quickly enter the CareerFair and be on your way to meet any of the 130+ companies who are there to talk to YOU! How do you get a Fast Pass you ask? Well, all you have to do is bring yourself (and your ID) by the recruiting office (LaCava 205) to grab your fast pass AND be entered to WIN a pair of Wireless AirPods. Here’s a quick video how-to! See the flyer below for our special Career Fair Fast Pass hours. We hope to see you soon! Stay tuned for more content on CareerEdge Mon-Weds of next week!